Have you ever had one of those moments where you’ve been working on a problem for a while (or trying to figure something out) and then (almost out of nowhere) everything ‘clicks’…and it suddenly makes sense? What if this ‘click’ was so dramatic that it helped you get more accomplished than you ever thought possible? And all of sudden, you no longer had to wonder why you weren’t achieving your goals and instead knew exactly what you needed to do to keep hitting them? And what if it was all based around a super simple productivity technique that ANYONE can use? In this episode of Deconstructing Success, you’ll hear from someone who experienced a “life-changing click” last year, what the simple productivity technique was and exactly how you can use it to achieve your own goals each day. In this episode, I interview Glen Allsopp, a young man from England who quit college at 18 and moved to South Africa to become the social media manager for massive brands like Land Rover, Nissan and Hewlett Packard. At the age of 19, this self-described “introvert” went to work for himself and now runs his own 6-figure a month marketing company from all over the world having lived in the Netherlands, South Africa, Thailand, Malaysia, and Singapore…among many other places. I’ve known Glen for many years and wanted to interview him for the show but I didn’t want to talk to him about travel or marketing or any of the things that he’s typically interviewed about. I wanted to know how he got to where he is today and how gets SO much done. 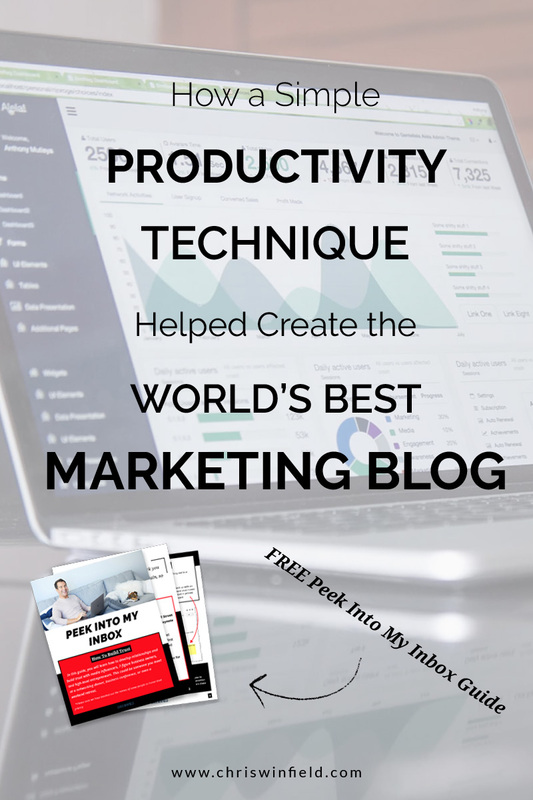 And this idea was sparked by a blog post he wrote a few months ago titled, How a Simple Productivity Tool Helped Create the World’s Best Marketing Blog. 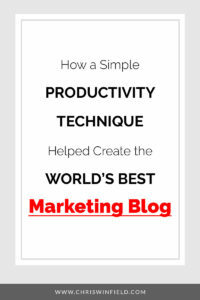 The simple productivity tool he was talking about was the Pomodoro Technique and his insights into this amazingly effective productivity method blew me away. 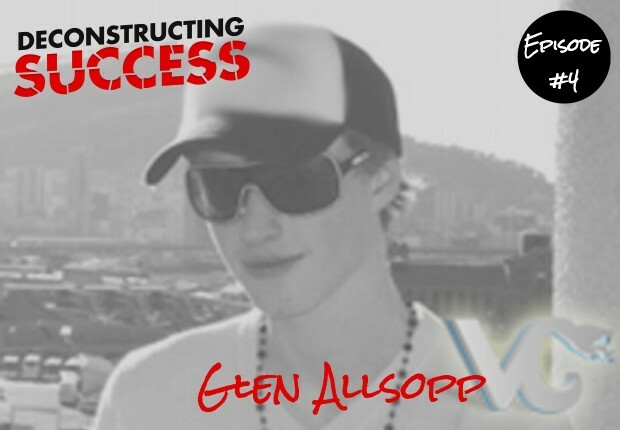 We’ll cover all of that (and so much more) in this exclusive interview with Glen Allsopp in Episode #4 of Deconstructing Success! 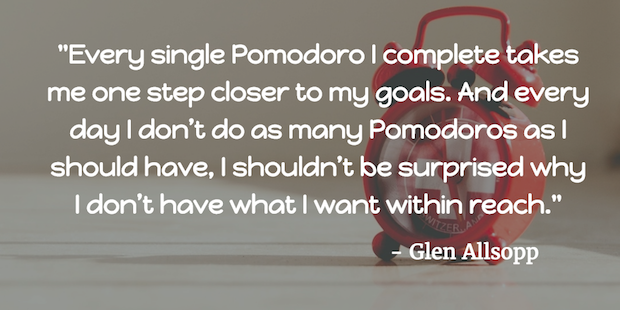 Why Glen says “no to everything,” and how he cultivates “a singular path” of his career. The reason he quit a “dream job” where he was given 3 million dollars to spend on buying websites and was making more money than he ever had in his life. How Glen avoids dropping new habits after the initial excitement wears off. Why working for 4 hours (or 10 Pomodoros) per day is enough for him to accomplish everything he needs to get done. The lightbulb moment that allowed him to stop wondering why he wasn’t achieving the “stretch-goals” he set for himself and how he actually start acheiving them. And how this helped crystallize something big for me as well. Why it’s so important to remember that the little things stack together over time to create much bigger wins. And you just have to make sure to keep hacking away at the little challenges each day. What do you for the first 60 minutes of each day? Have you found a correlation between accomplishment and overall happiness? Why do you choose to focus on small, incremental steps rather than big, massive action? You’ve said, “I don’t think I would be where I am today without the Pomodoro method.” What is it and why is it so important? What’s one thing that keeps people from being successful? At 16 Glen’s first website was featured in the book DJ’ing for Dummies. 7 years later Wiley asked him to write his own for Dummies book. Glen quit college at 18 and moved to South Africa to become the social media manager for massive brands like Land Rover, Nissan and Hewlett Packard. He was profiled by the Guardian as part of their feature on “digital nomads” traveling the world while working online. Glen runs his own 6-figure a month marketing company from all over the world having lived in the Netherlands, South Africa, Thailand, Malaysia, and Singapore…among many other places. It’s either HELL YEAH! Or no. Have you tried the Pomodoro Technique? If so, how many do you average per day? Leave a comment below with your answer. If you enjoyed listening to this episode of my new podcast, then please support the show by subscribing and leaving a quick review on iTunes. It’s easy and takes less then 1 minute to do! This was exactly what I needed at this point in my pursuit to success online. I’m very thankful to Glen for getting this personal (as he always does on ViperChill), and for this podcast Chris. You both really have changed my life. Thank you. Thanks Terrel — it means a lot to hear this! Glad you liked the show, Terrel. Much appreciate you having me on here, Chris.